In this video, we are going to look at how to multiply a trinomial by a binomial. 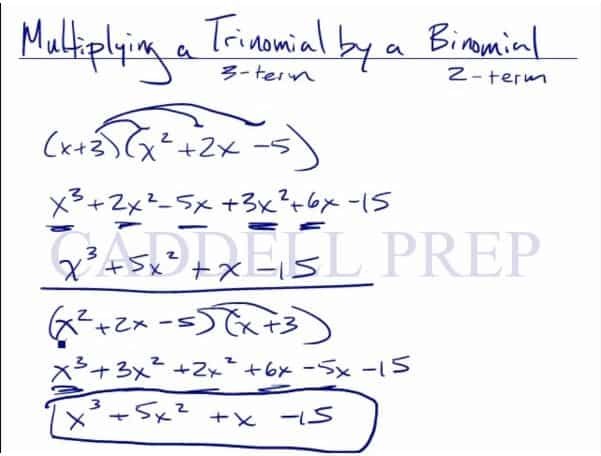 To multiply we have to distribute each term in the binomial to each term in the trinomial. Let’s go over how to multiply a trinomial by a binomial. Trinomial has three terms and a binomial has two terms. Let’s go over multiplying a binomial by a binomial first. We will just distribute each term into the second expression then combine like terms. Now, let’s try a binomial times a trinomial. We’ll follow the same rules. So, let’s distribute each term into each term of the second expression. And we can also do the same thing the other way around. Here, we distribute each term of the trinomial into each term of the binomial. It may look different. But if you look closely, we have the same exact terms whereas you did up here, just in different orders. So now, when we combine like terms, we’ll have the same result. As you can see, we have the same answer. It doesn’t matter which way you distribute. Just make sure you distribute both of them.